Emerson joined us today since Grandma and Grandpa are up north at the cabin. 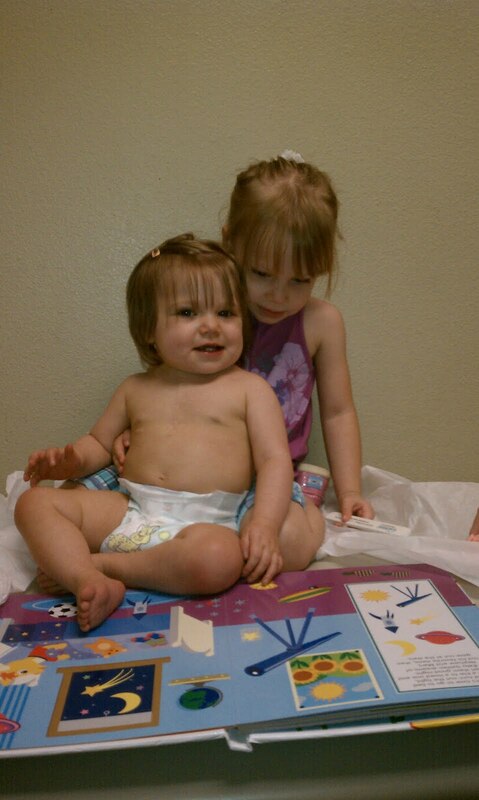 Emerson proved herself a wonderful big sister, keeping Zoe preoccupied as she waited for her exam. Even though it was an early morning wake-up, Zoe cooperated for her ekg and echo. With her relaxing during the echo, the tech was able to get some good pictures of Zoe's heart. Dr. Stock said that her function looked "NORMAL"; better than before. 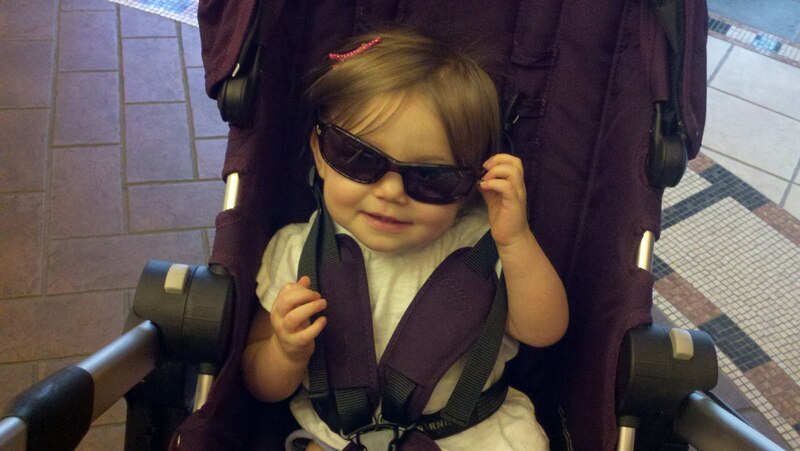 The timing of Zoe's next surgery is completely up to her, and her body. They'll know she's "ready" when her oxygen saturations begin to decline and her coloring changes from pink to blue. Zoe's tune up in Philadelphia was a success and we're not due back for a cardiology visit for another FOUR months! As Dr. Stock left the consult room he turned around and said goodbye to Zoe. The look on her face was priceless. She grinned big and wide, squinted her eyes and gave him the most mischevious stare-down. Oh, that girl is definitely going to give me grays and wrinkles - and I'll cherish every single strand and line. We are fortunate. Very fortunate. The good condition of Zoe's heart is not lost on us. Not for a split second. In the last few weeks, as many heart families lost a child, received disheartening news or lost some hope, we are able to be thankful for each day - we are especially thankful for the days when we can lose sight (if only for a short while) that her little heart is only half-whole. Keep up the good fight, Miss Zoes. Your mom, dad and big sister (along with hundreds of fans) are so very proud of you! A fellow heart momma commented today on facebook - after the positive cardio news - with the message, "Live it Up!" Thank you, Michelle, and everyone supporting our baby girl. Live it Up, we will! 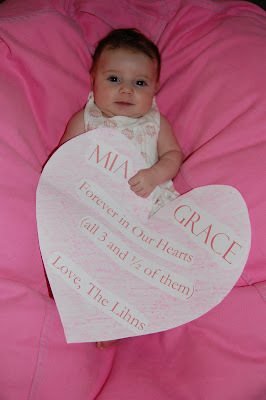 July 25, 2011 marks the one year anniversary of Mia Grace Marrone's passing. If you haven't met Mia Grace, learn about she and Zoe here. A year ago, today, Caleb and I were at a baseball game with Emerson when Caleb informed me that Mia passed away. That day, that very moment in time, is forever etched in my mind. It is a moment I cannot escape and a reminder that every second spent with Zoe is a blessing. I am proud to say that Mia's mom, Jen, and I remain best of friends. I am so blessed to have her family in my life. Please send a pleasant thought and prayer up for the Marrone family as they're reliving a parent's worst nightmare - the death of a child. A year has now passed since Jen held Mia in her arms. I feel helpless, as I know there is nothing I (or anyone) can say or do to take away the pain, anguish and hurt they're experiencing. What I can do is let the Marrone family know that we remember and that their precious daughter will never be forgotten. We love you Jen, Ray, Cole, Madden and Mia. Zoe did great on the plane ride home. She loved looking out the window, pointing and yelling. Not quite sure who she saw, but perhaps the angels on the wings. When we returned home, Zoe received a huge welcome home hug from her big sister. 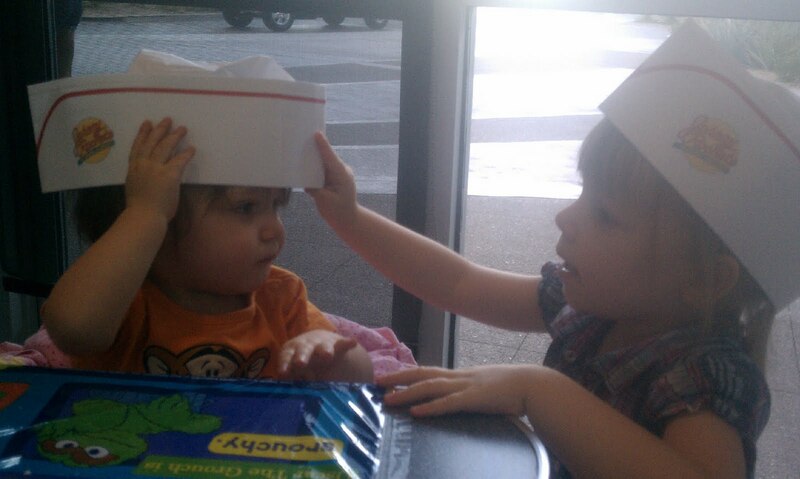 Emerson was so happy to see her. The next day, I realized that Emerson knew a lot more than I thought. She placed her Lambsie on the desk in our home office and used Caleb's Mac charger as an instrument. She placed the end of the Mac charger to Lambsie's chest and told me she needed to "fix Lambs' heart." Sweet, sweet girl. I nearly lost it. 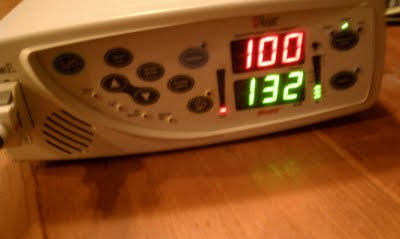 Zoe's cardiologist in Philadelphia is not quite sure why her sats are so high, but doesn't see any reason for concern. Her explanation was a shoulder shrug and a "maybe she really likes the elevation in Phoenix." I like to think its all of the positive energy, Reiki and prayers she's been receiving over her lifetime. So, we're home and all is well. We've resumed 'normalcy' and are focused on having fun with our beautiful girls - who now fight like sisters. Zoe's biting really needs to regress as Emmy and I have a few bruises that we could do without. She's a fiesty one, I tell ya! Emmy and Zoe had a great time at a recent HopeKids event at the Phoenix Children's Museum. Zoe finally met one of her biggest fans, and fellow CHD warrior, Trey. We also went to our first movie, as a family, to see Winnie the Pooh - one of Emerson's favorites. The girls enjoyed the movie and loved eating at Johnny Rockets afterwards. Emerson "helped" Zoe put on her diner cap. It was only 14 months ago, however, it seems like an eternity. This photo was taken in Rittenhouse Square in Center City, Philadelphia on June 6, 2010. 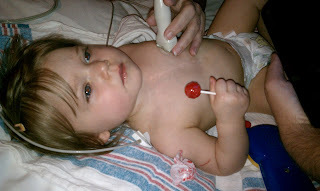 Earlier that week, we were discharged from CHOP following Zoe's first open heart surgery, the Norwood. Because we traveled a great distance and had a long flight back to Phoenix, Zoe's CHOP cardiologist wanted us to stay in town for a week to make sure there were no complications or issues. We kept Zoe confined to our hotel room, with the exception of this quick stroll through Rittenhouse Square. 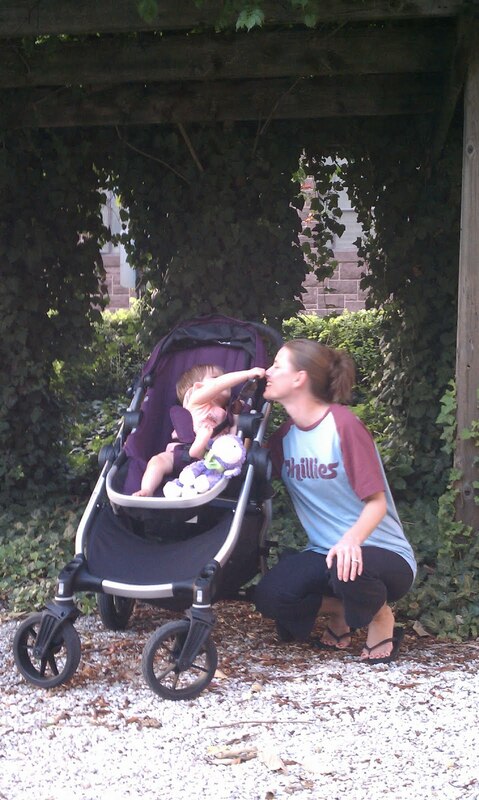 Today, on Zoe's last full day in Philly following the recent cath procedure and ballooning of her left pulmonary artery, we revisited the site of Zoe's first outdoor photo. As you can see, she has grown so much and come so far in this long 14 months. We are so proud of our little heart warrior. We love you Zoes. Zoe spent the night in the CPRU last night, as did Mommy. Zoe had a very restless night and refused to sleep until 4 a.m. 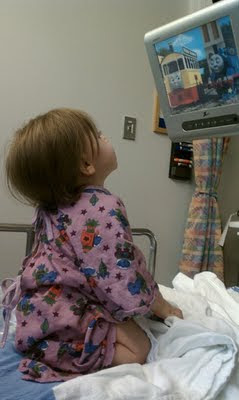 Unfortunately around 1 a.m., Zoe needed a blood transfusion. Her hemoglobin increased, as they'd hoped, however, since we are flying home and her saturations will drop at higher altitude, they wanted her to have a boost of red blood cells. So, from 1 a.m. to 3 a.m., Zoe received a transfusion which included hourly vital checks. Poor babe was NOT pleased. She rocked in mommy's arms for several hours. Around 4 a.m., mommy and Zoe were able to get some rest. By the time the nursing shift change occurred at 7 a.m., Zoe's discharge papers were in the works. And mommy started snapping Zoe's discharge portraits. By 9:30 a.m. we walked out the doors of CHOP. Awe, such a great feeling!!! We are very pleased with the outcome of this visit. Zoe did great and her doctors are happy with the results. We were in contact with Zoe's local cardio, Dr. Stock, who was very happy as well - and ordered us to eat a cheesesteak for him. Today, we've been attempting to manage Zoe's pain. She's been quite uncomfortable and I'm glad we have another day of recovery before hopping on a plane. Sometimes she can be extremely fussy - who can blame her - she has two cath sites, one in her right groin and one in her neck. Poor princess! Zoe did not want to be locked up in the hotel room today, so we did a lot of walking around University City (where CHOP and the Univ. of Penn campus are located). The weather was perfect today - a nice change for us Arizonans. Tomorrow is another day of rest and pain management for Zoe, so I assume we'll be doing a lot of walking and enjoying some of our favorite sites in Philly. Thanks again for keeping up with the Lihns. We really appreciate all of the love and support (as always). So the cath is over...sorry for the delayed update, we were talking to the docs and were with Zoe for a bit. They ended up needing to do some intervention during the cath. Specifically, they had to balloon dialate the left pulmonary artery, which was fairly narrowed. Dr. Glatz was happy with the outcome of the dialation. He also indicated that despite what the last two Echos indicated, the heart function is actually normal. Her aortic arch is also improved from the last cath. Overall, he said the heart looks really good. She does have collaterals, however, he said they are completely on par with what the average hypoplast kid has at this stage. So all in all it is pretty good news. The thing we were most concerned about was the decreased heart function, and the MRI and cath essentially relieved that concern. As of now, she is on pace to have her third planned open heart surgery, the Fontan, at age 3. She is awake and extubated, but pretty uncomfortable and just vomited all over her bed. We have to make sure she remains still for the next hour and a half, which isn't easy for Zoe, she likes to move. She will spend tonight in the hospital and have a chest xray and blood work in a few hours. Assuming those tests are normal, she should be discharged in the morning. We will update again later. Thanks for all the positive, thoughts, energy and prayer. Cath in progress. They are still taking pictures and measuring pressures. No indication of intervention yet. Zoe is still stable under anesthesia. Next update in an hour. The cath is in and they are taking pictures, she's doing well. Not sure if intervention is warranted. Next update at 11:00 a.m. eastern. Dr. Glatz explained earlier that if intervention occurs, she will need to spend a night in the hospital. If intervention isn't necessary, after the cath, she will need to lie still, on her back for 6 hours - then we'd likely be discharged. We were just told that they are finishing up the MRI and they plan to move forward with a cath. We will receive our next update at 10:00 a.m. eastern time. About an hour ago, anesthesia took Zoe back to get her ready for the MRI. Before she went back she was given Versed to make her drowsy. Once back in the intervention lab, she will be given a IV anesthesia and intubated. The MRI scan itself should take about an hour. We also just spoke to Dr. Glatz. He explained that he was a bit biased to performing a cath, if nothing else to obtain pressures inside the heart and lungs which can't be obtained via MRI. He said if he had to "guess" he didn't think intervention would be neccesary. After the MRI, Drs. Szwast (Zoe's CHOP cardiologist), Glatz (Zoe's interventional cardiologist) and Harris (cardiac radiologist) will review the MRI findings and determine whether to move forward with the cath. We will receive an update shortly. Our day started around 11:00 a.m. ET, which is really 8 a.m. MST, giving ourselves limited time to get to CHOP. Since Zoe was ready for battle we put on her CHD fatigues - camo shorts. After dressing for battle, we headed to CHOP where Zoe's day began with weight check, sats, BP and EKG. She cooperated quite well, until halfway through her ECHO when she decided she was over it. When Mr. Tech wanted to get under her chin, she freaked (as usual). After the ECHO, Zoe went for her chest x-ray and blood draw. Get up at 3:45 for her last drink before her MRI, back to bed for an hour, then wake for a 5:45 a.m. check-in (which is really 2:45 a.m. our time) at CHOP. We'll meet with anesthesia and hand Zoe over for her MRI. During the MRI, Dr. Glatz (Zoe's cath doc) will update us on the findings and whether or not he thinks a cath is looking likely. If the pressures and measurements during MRI are undesirable, they'll take her in for a cath. During the cath, the procedures may include any of the following: coiling collateral vessels (discussed further below), dilation of her aortic arch and/or dilation or stent placement in her pulmonary arteries. If cath and intervention is needed, Zoe will stay overnight at in the Cardiac Preparation and Recovery Unit (CPRU). If no intervention is needed, we'll be discharged after 6 or so hours. We will have a lot more information tomorrow morning during/post-MRI. We'll keep you updated as much as possible. 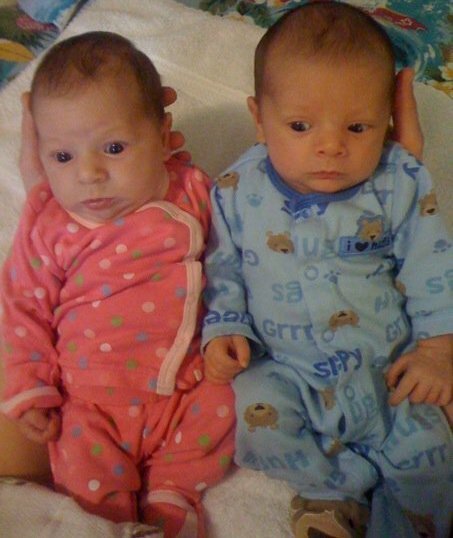 When you enter the hospital with your little ones, you lose all sense of time and space - time just stands still. Caleb and I had mixed emotions walking into CHOP this morning. I had visions of when we walked out the front doors of the hospital after Zoe's first discharge. It is so surreal how far she's come over the past year. Dr. Szwast thought she looked really good today and her liver (which can be enlarged in single ventricle children due to cellular changes) didn't seem enlarged much at all. We're going to reassess Zoe's medications upon discharge tomorrow, depending on the MRI results. Overall, testing went well and we had a good day. We received some explanation as to Zoe's decreased heart function and increased sats. Tomorrow, we will receive the remaining pieces to the puzzle and hope that she can coast to the Fontan... again, we're told they would like to wait until age 3... if Zoe can hold out that long. After our long day at CHOP, Zoe was EXHAUSTED! We walked around our old stomping grounds and enjoyed "Baltimore Avenue Dollar Stroll" in perfect weather. We enjoyed $1 ice cream and beer (not at the same time). Zoe napped during our stroll and Caleb and I reminisced about the last time we walked the streets of Philly. We walked by the Carriage House, through Clark Park and stumbled upon a children's story time; I was pleasantly surprised to see my favorite Amish couple selling their beautiful flowers! We returned to the hotel and gave Zoe a refreshing bath in the hotel sink. Thanks to all of our family and friends for the prayers, positive energy and happy thoughts over the past several days. We're very appreciative and feel extra loved. As many of you know, today we flew from Arizona to Philly for Zoe's MRI and possible cath. Since prior to Zoe's hemi-Fontan surgery, her aortic arch and pulmonary arteries appeared narrowed on echo. During the hemi-Fontan surgery, Dr. Spray patched (widened) the pulmonary arteries. 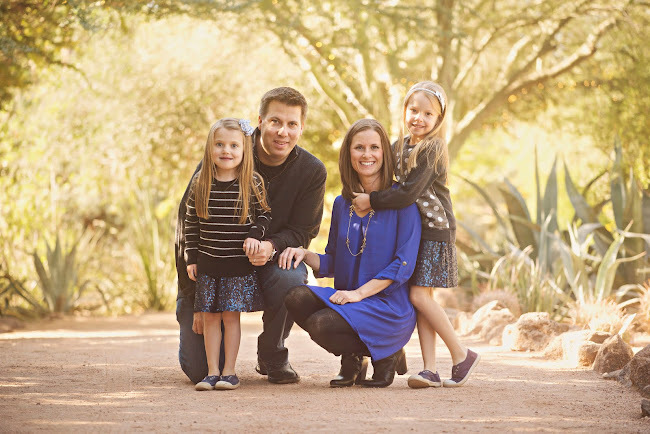 At the most recent cardiology appointment in Phoenix, not only did the aortic arch and pulmonary arteries still appear narrow, but her heart function also decreased from normal to low normal. Given the presence of all three issues, Dr. Stock felt more investigation was appropriate. Thus, our trip to Philly. 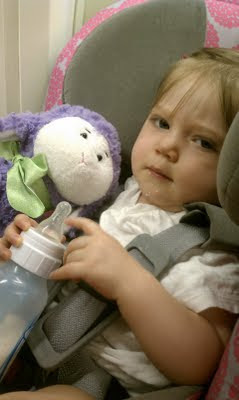 We were hoping Zoe would cooperate on the plane ride, and boy did she ever. At first we weren't sure...this was her face immediately after the pilot announced our destination; seriously, it was perfect timing. After settling in, she did great. Zoe slept for three of the four and a half hours we were in the air. During the flight, we checked her oxygen sats and she came in between 75 and 80, while she was sleeping. Much lower numbers than usual (sending Stacey into a bit of a panic), but lowered sats are to be expected in the high altitude. 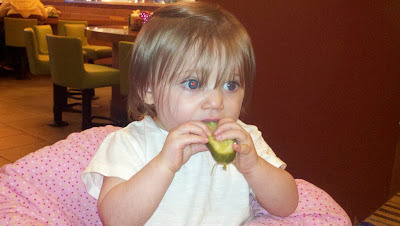 Once we arrived in Philly and cabbed to the hotel, we snuck out for dinner. Zoe, the CHOP diva, strolled around like she was back in her old 'hood. On the walk home (in unexpectedly great weather), we were stopped by a Planned Parenthood advocate. After speaking with her for a few minutes, we learned she is a recent nursing graduate and accepted her first full time nursing position, working in CHOP's PICU. We introduced her to Zoe and told her she is a cardiac kid, here for some testing. She followed up with, "oh, what does she have...Tetralogy of Fallot?" We said, "no, HLHS." A concerned look came across her face and all she said was "oh." Yep, we know how serious it is. 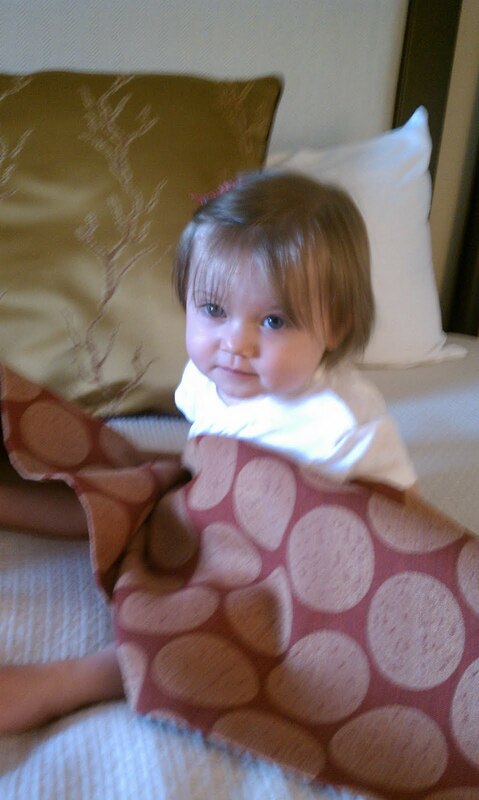 We brought Zoe back to the hotel room and played with her, chased her around, tickled her and explained that she has a big couple of days ahead of her and she needs to be on top of her game. 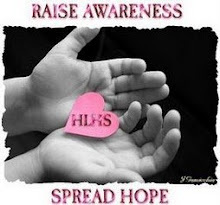 Tomorrow is Zoe's pre-procedure appointment which includes an echo, EKG, blood work, chest x-ray and exam. Friday is the MRI and potential cath. We won't know if a cath is necessary until after the MRI. While we were playing with Zoe tonight on the bed, we told her if she convinced the docs that all she needed was an MRI, we would do whatever she wanted on Saturday and Sunday. Let's hope it's a Zoe planned weekend!